Walmart is my favorite store!.. seriously. Anyways Walmart was having their Anniversary sale and I was hoping that they would have makeup products on sale. I've been wanting this quad for quite awhile and $3.88 CAD on sale equals I had to get it! 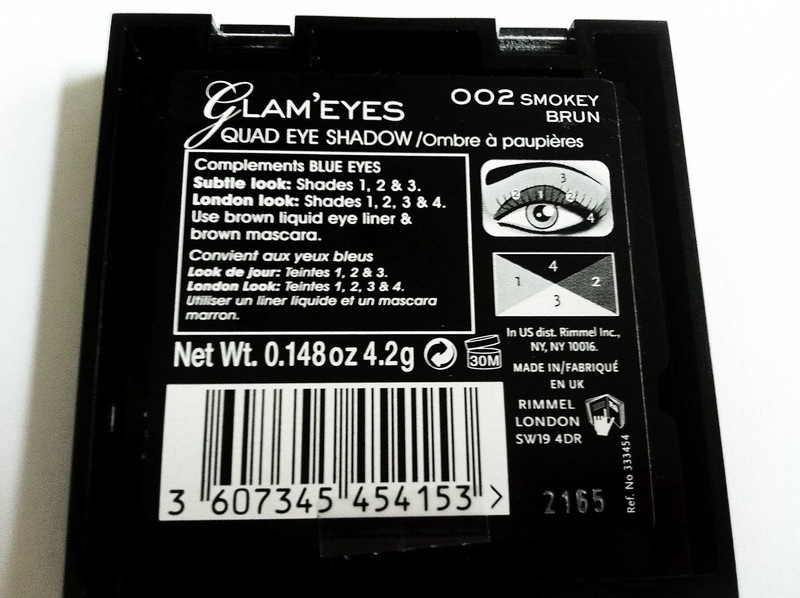 I usually wear neutral colors most of the time so I decided to try out this quad in 002 Smokey Brun since it has browns. At my local Walmart these quads retail for $5-6. 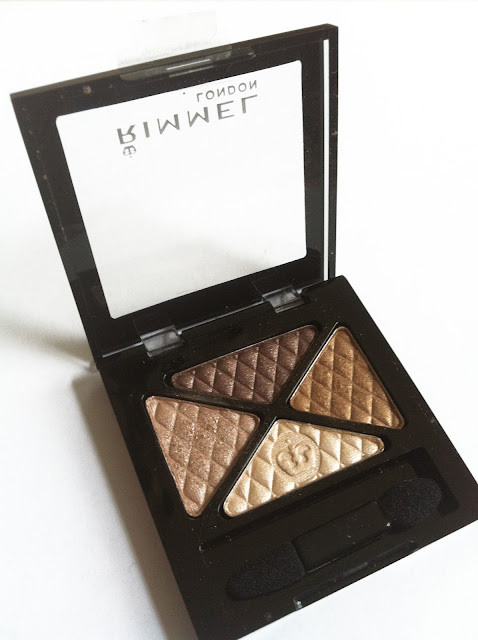 I love all the colors in this quad they're so pigmented and nice neutral colors. 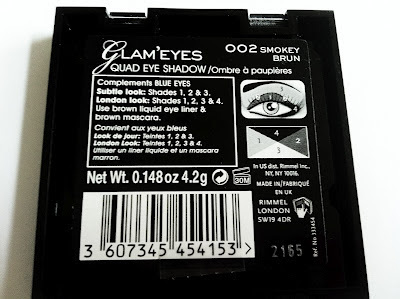 These eye shadows are not chalky they're very silky and smooth. They blend really nice. It comes with a eye shadow mini brush just like quad usually do but I don't really use it unless I travel and forgot my brushes. The back of the packaging has instructions on where to apply each color. This can be helpful for beginners who are just getting into makeup. Here are some swatches on my hand, there is no eye shadow primer. They're very pigmented. Since I bought this, I've been using it everyday. I even wore these colors to an interview I had this past week. I love this quad and can't wait to buy more of these. I like how they're small enough to throw into your makeup bag to take with you travelling. 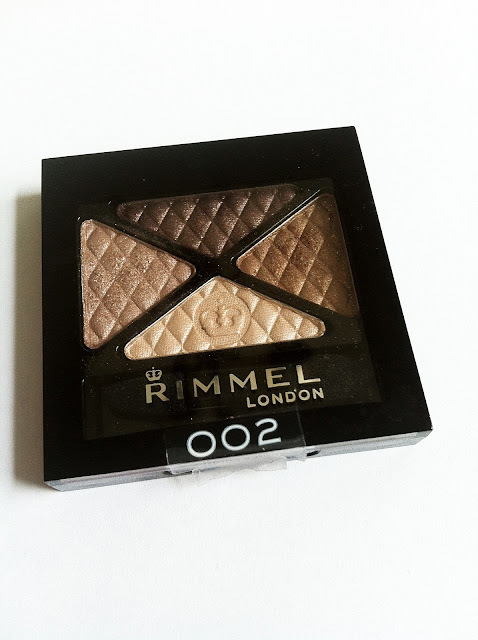 Have you tried any of Rimmel's quad? Which ones do you recommend?